The vision of The Key is E came from the hearts of two extraordinary Africans and social activists, united by a passion to improve children’s lives. 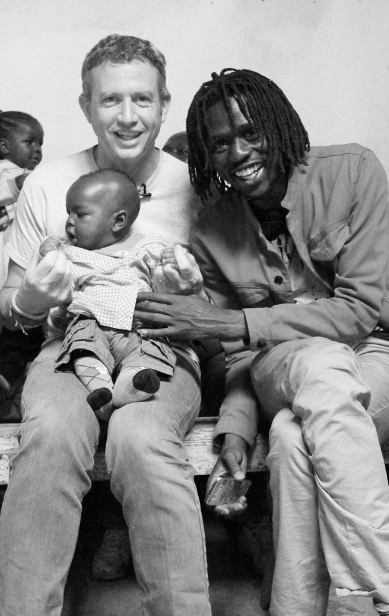 Paul Lindley and Emmanuel Jal dreamt of creating an organisation that would bring to life the ambitions of African social entrepreneurs whose mission complemented their own, by positively impacting children. Emmanuel grew up as a child soldier in South Sudan, before being rescued by a British aid worker and taken to Kenya. There, he overcame his struggles to emerge as an award-winning recording artist and peace activist. Paul grew up in Zambia. He is the founder of Ella’s Kitchen , a leading global brand of organic baby food and Paddy’s Bathroom , a social start-up producing organic toiletries for toddlers while providing clean water to communities in Rwanda. In 2014, Paul and Emmanuel spent time in Kenya meeting social entrepreneurs and offered financial and value-in-kind investments to several of them. By the end of the trip they were clear that exponential social impact could be achieved by offering communities more than just financial support. of The Bright Ideas Trust. The Key is E. Actor, musician and activist. and Kenya director of Ubuntu. Catering and St Martin's School, Kibera. consultant and founder of The Seed, Africa.